Inking Idaho: Bye Bye Love You Much! Accessories: Candy Lane DSP, 1 3/8" Circle Punch, Scallop Circle Punch, 1/8" Circle Punch, Chocolate Chip Grosgrain Ribbon, Flower Fusion, brads, Stampin' Dimensionals. 1. Start with a half sheet of paper, 8 1/2" x 11". Cut 1 1/4" off one side (front) and use the corner rounder on the top back two corners only. 2. Chocolate Chip cardstock is 6 1/4" x 4", score at 2 1/2". Fold on score line. This piece does not reach to the middle on the inside, it is about 1/4" from the center score line. It just worked out that way, you can make it longer if it bugs you. Because the Chocolate Chip is dark to write on, I put a piece of the light pink DSP in the Candy Lane DSP pack on it, size 3 3/4" x 3 1/2". 3. Whisper White piece is 3 3/4" x 2 1/4". Stamp image. 4. Striped DSP on the bottom of the card is 5 1/4" x 2 3/4". BTW- I live just outside Boise also...small world! Super cute card, Becky! Seriously? You hate this set? I feel that way about Sock Monkey. I appreciate your honesty!! I feel the same way about the set...not my fave!!! Your work is really beautiful!! Love your card, even tho you hate the set you have made a fabu card with it!!! Thanks so much for sharing! I really like this style of card, can I have the dimensions or instructions too? I guess I like this set because I love hearts but I understand it can be too cheesy. I didnt order the set, thank goodness, I mostly hate all the crap it brought with backorders........The card is lovely however.....I am just about to start cutting the paper I need to make your lovely gift box, thanks for the tutorial! I have a hard time thinking you hate this set when you've made such great cards with it. I love your card. I saved the picture in my card ideas file. P.S. Thanks for the comments on SCS. P.S.S. I'm looking forward to our next group get together. That's hilarious that you can turn out such gorgeous cards even with a set you hate. LOL Great job with it Love the flip and tuck thing it does. I find it hard to believe anyone could hate this set...but you did beautiful work with it! Will you share the measurements of the card? Great card! I didn't buy this set, but I really like it alot, very pretty for a set you don't like...I have the sock monkey, too, though I haven't used it much, I was encouraged to buy it by my daughter.....love you blog! Well, I think you did a beautiful job for not liking the stamp set!! OH NO!!! !---I love this set and the Sock Monkey!!!! OMG - THANK YOU!! I was beginning to think there was something WRONG with me for hating this stamp set! I have seen soooooo many things made with it and was starting to think I was the only one that didn't order it (or want it). I have to give you huge props for making such an adorable card with a set you don't even like - You are truly blessed with a talent that escapes me. Thank you for all your beautiful ideas and projects. Wow! this card is gorgeous! you did such an awesome job with a set that you hate! also thanks for sharing the instructions. OMG, you are too funny. I hate this set too but your card is beautiful. I never would have known if you hadn't spilled the beans! Becky I love this fold. I have tried several different ways to get this look, but you have it figured out.....way cute!!! 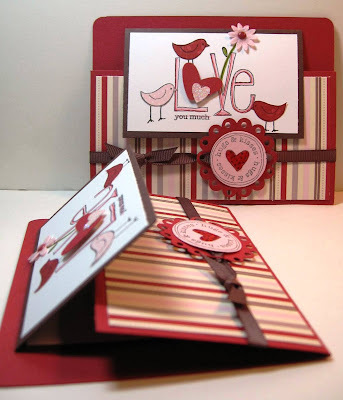 Hi Becky, Love the card I like the others can't believe that you hate this set & do such a great job with cards. But taht is OK, can you imagine how boring life would be if we all liked the same thing. I do have a question on your directions "At what dimension do you score the 8 1/2 x 11? " My email is "kraftynes@sympatico.ca"
Thanks for adding the instructions! You rock!! Well, no matter what your feelings are for this set, Thanks for making such a beautiful card - and I am so proud to be the owner of one of these! Best of the bunch in the swap! I live just outside Boise also...small world!